Wow. I’m really behind with post update, aren’t I? Well, mainly because I have been actively seeking a job. It’s like at this point, my standards are getting lower and lower. It’s amazing that in the service industry, even a cashier requires a year of experience. Really? If nobody gives you a chance, then how can one GAIN experience? Guess that’s when fast food chains come to play. I believe in fate, really. If it’s meant to be, then be it. In the past two weeks, my right foot was in several employment opportunity doors, yet my left foot was still outside, meaning no certainty. Some never got back to me, while others was a waiting game. I am tired of waiting and making difficult decision, so when one shop decided to hire me on the spot (guess they really needed help as well), I just jumped in. I also had good rapport with the owners and a professional and friendly relationship is important in a workplace. On my second day of way, I have already improvised my own creation. 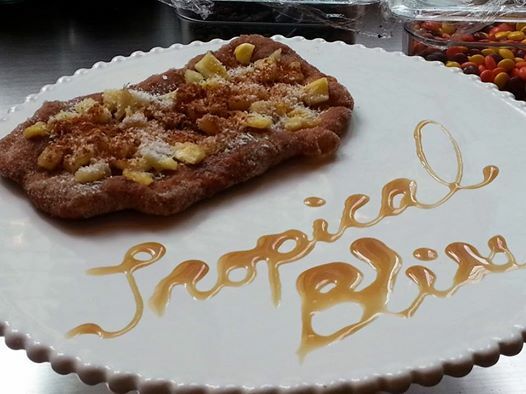 I called it “Tropical Bliss” – a flash-fried whole wheat pastry dusted with cinnamon sugar, then layered with fresh pineapple, showered with shredded coconut and a final touch of cinnamon. Not the ‘healthiest’ snack, but hey, it’s whole wheat, so not as bad as a churro (which is similar in flavor).